Add all ingredients into a blender and process until smooth. Serve immediately and garnish with whipped topping and chocolate chips if desired. Squeeze fresh lemons, careful to discard all seeds. Add liquid to a blender. Add the ice cubes, frozen peaches and sugar to the blender. Turn blender on high and on the mode that will crush the ice completely, allowing it to run for about 45 seconds. Serve in glasses when cold. If storing, place in the refrigerator (covered) where it should stay fresh for 1-2 days. A Smoothie is a thick drink made in a blender. Smoothies usually contain fruit of some kind, and may also contain other ingredients such as milk, soy milk, yogurt, ice cream and nutritional supplements. Recently, smoothies have enjoyed a boost in popularity due to their reputation for being healthy, but this drink has actually been around since the mid-20th century. The term “smoothie” has been around since the early 20th century, but it wasn’t until 1930 that it was used to describe a drink. Early smoothies were simply fruit, fruit juice and ice, and they were an obscure concept in the United States until the natural food craze of the ’60s and ’70s. During these decades, health food stores popped up around the country, and these stores often made and sold blended fruit drinks. Just about anything can be made into a smoothie. Some smoothie makers add vegetables such as spinach, carrots, seaweed and even hot peppers to their smoothies extra healthy. You can also find chocolate, vanilla and coffee smoothies in many places. Some of these smoothies may seem more like milkshakes, but for the most part, smoothies contain healthy ingredients, such as vitamins and protein powder, and are often lower in fat than other creamy drinks. Smoothies look and taste best right after you blend them. 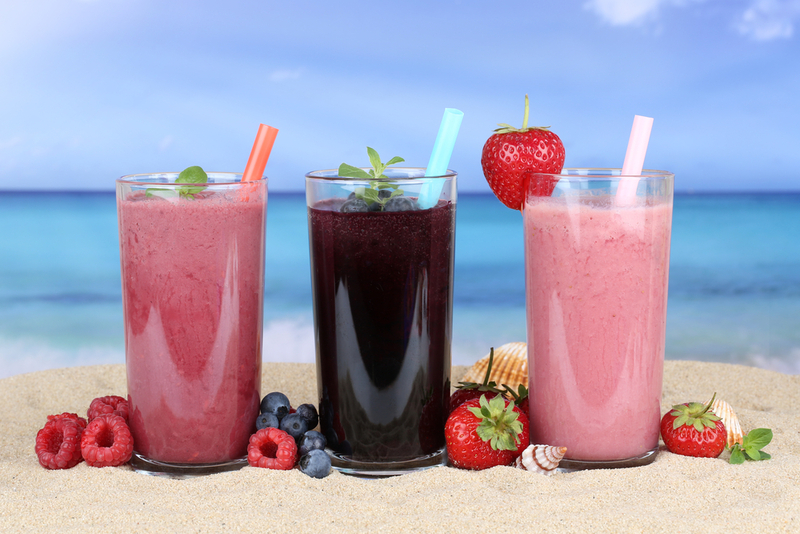 The fruit in smoothies starts to oxidize when you chop it, which leads to browning within a few hours. You can halt the enzyme action that causes the color change with acidulation, a fancy term for blending a bit of lemon juice into your smoothie, which allows you to store fresh smoothies in the refrigerator for 24 hours or in the freezer for up to a month without losing quality.